11/04/08 - Stream full Calexico concert, see them on upcoming tour! 08/14/08 - Watch the music video for Calexico's "Two Silver Trees"
07/21/08 - New Calexico MP3 and video clip! 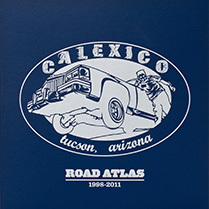 07/08/08 - Watch the new Calexico album trailer! 06/10/08 - Download free MP3 of Calexico's "Crystal Frontier"
06/03/08 - Calexico goes into SPACE! 10/23/07 - Calexico to participate in "I'm Not There: In Concert"
04/21/06 - Calexico on Tour � Presale Tickets Go on Sale Saturday at 12 PM! 02/03/06 - Calexico/Iron & Wine Win at Second Annual Plug Awards! - A heavy duty, linen wrapped, screen-printed slip case to house it all!